I am glad he loves school and I am glad that 4th grade is exciting. He showed us every nook and cranny of the room, every art project, every piece of writing, every soon-to-be hatched chick egg in the incubator. He was so proud. And of course, I was proud too. The biggest deal, however, was the grand display of the infamous 4th grade salt maps. I remember doing this project with Tweedle Dee three years ago and with her being my oldest, didn’t realize how important this project was. What the directions should say is this: Help your parents make a mess in your kitchen. Come up with a really clever idea unlike anyone else, go all out in decorating it, and bring it in early to set the bar for your classmates. The only thing good about this project is that is was over and done with by October 10th. I did struggle with where to draw the line in terms of helping him. 1) I wanted him to have the experience in making the choices, designing it, and being creative. 2) I wanted to teach him how to put his time and thought into it a project like this. 3) I wanted him to learn how to use the computer for both research and word processing skills. 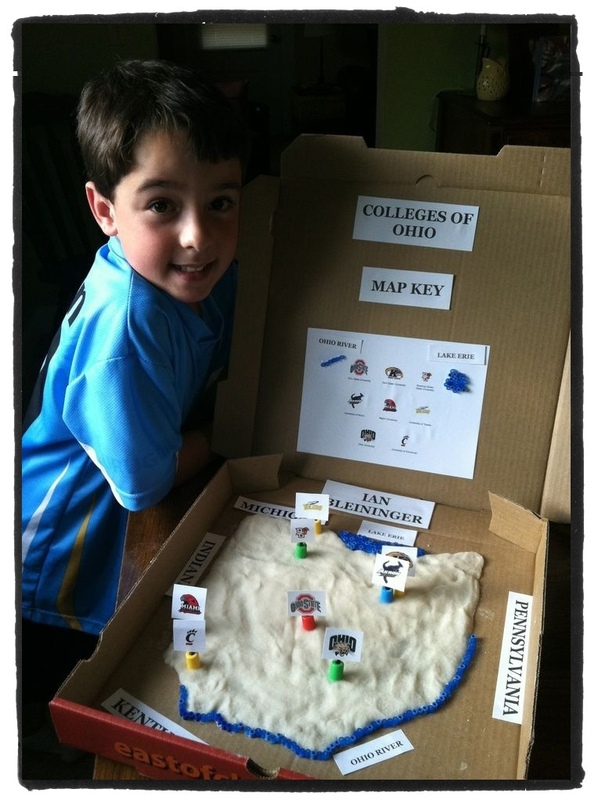 4) I wanted him to be proud of his salt map. Tweedle Ian took his map in 2 days early and he was pleased with it. Thrilled, actually. I was happy it was somewhere right in the middle of the road. As Tweedle Ian wanted to breeze through some of the “lesser” salt maps to get to the “totally sweet” maps, I made a point to stop at each one and say something I liked about it. I felt like it was important for him to recognize that everyone who brought one in made the same effort (and mess) at home. They used the resources they had and did their best. My heart went out to some of those kids, because it had to be tough to have a map that was any less than the best. I know, from similar personal experiences, that it’s easy to feel inferior about things like this. This is why I make sure that all of our projects are done completely in school! Everyone gets to watch everyone else struggle, they all get a chance to help someone else, and nobody has the professionally produced native village made of material that the child can’t identify! My boyfriend had his 5th graders make Native American habitats completely at a school. He provided materials and everyone’s was similar in quality. They turned out great! I bet the parents appreciated it too! !